We’ve discussed the chemistry of life; how electronic transactions make it possible for matter to be called alive. This includes general concepts about Chemistry, water, hydrocarbons, and, more recently, hydrocarbon derivatives or functional groups. These functional groups, along with very cool interactions that, in many cases, function as lego pieces sticking together, can make large molecules–known as macromolecules–which are vital for life; they are known as, simply put, the molecules of life. If we want to know about the molecules of life, we need to understand how they are formed; the mechanics of large molecule formation. Big molecules need some sort of automatic chain formation known as polymerization. Polymers, which can be millions of molecules long, occur thanks to dehydration and hydrolysis; these two reactions are enzyme mediated. Think about the REDOX reactions we’ve discussed earlier; acid/base reactions resemble polymer synthesis: we have hydroxyl and hydrogen cations working to add monomers, until we have a chain, known as a polymer. The following images will account for each type of carbohydrate. 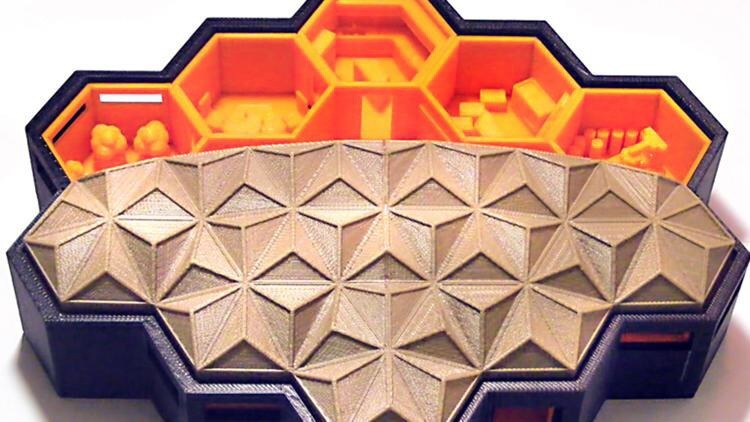 This structure, which resembles beehives, has been designed so that, in a not too distant future, we can colonize Mars. What carbohydrates exist in honey? The picture above is the result of mankind, once again, imitating nature. For all animals, nutrition and nurture are very important. And bees are experts at this. So what better example to follow than the one set by our pollinating friends. Bees are capable of regurgitating a nectar that evaporates and then transformed into honey. This evaporated regurgitation tastes sweet. It is a disaccharide, made out of two monomers (sugars): fructose and glucose. Fuel. There are different kinds of polysaccharides. Like apps on a smartphone. The second type is for energy storage, as opposed to the aforementioned polysaccharide which is for a quick energy fix. Potatoes saved the life of hundreds of thousands of Irish people during the XIX century; they’ve become part of the global diet, but, like many other foods with widespread use, potatoes come from America. 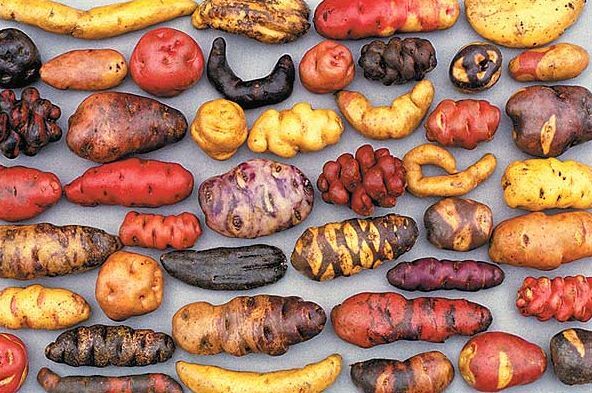 This image shows a small sample of the 5,000 varieties of potatoes that exist in Peru. Potatoes have a storage polysaccharide known as starch. They are great for reserve: glucose is made and stored in starch granules. Glycogen serves the same purpose, but its synthesis occurs in animals. Our livers are responsible for the synthesis of this giant polysaccharide. 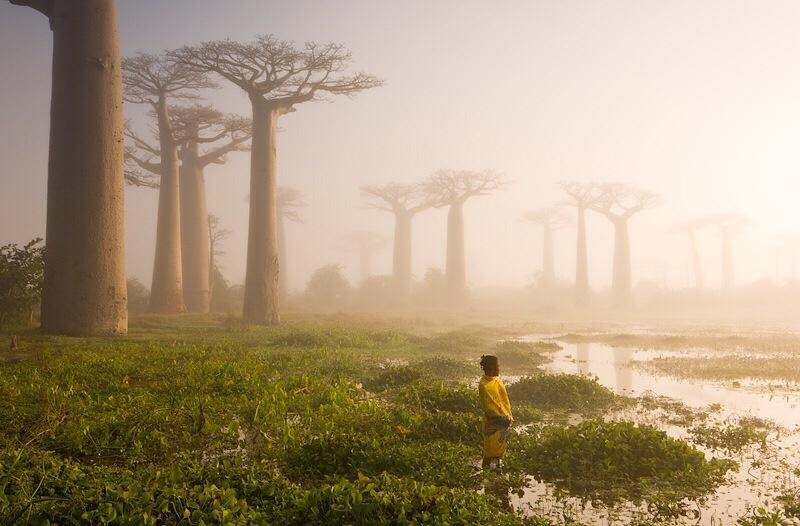 These are baobabs trees in a forest in Madagascar–part of Africa, and a huge island. Some of the trees are over 1,000 years old. Cellulose is a structural monosaccharide, meaning that it is used as brick and mortar, mainly for the architecture of plants–from a blade of grass, to the bark of an old tree. Cellulose makes up the cell wall that surrounds plant cells. We’ve seen the mayor polysaccharides. Their functions:nurture, storage, and structure. Next class we’ll see other molecules of life, vital for the symphony of matter that refuses the chaos of the universe. This entry was tagged Chapter 5: Macromolecules. Bookmark the permalink. ← The Caribbean Manatee: special post for the week of manatee conservation, Sept. 7 through Sept. 15, 2014. Humans could theoretically live off a diet of potatoes, butter, and milk. Wow I didn’t know that carbohydrates, proteins, and lipids were so important to life. Now that I know that I’m going to watch out for the carbohydrates and proteins I am eating. Life is made out of the same components; it doesn’t matter if we are talking about bacteria or trees. This means that all living matter needs the same stuff to thrive. Carbohydrates are very important for life. They are our main source of energy and they are like the fuel for our body. If we have a good understanding of the chemical properties of carbohydrates, then we can continue developing technologies that one day might release us fro m oil addiction. The world desperately needs and alternative. I find it ironic how many have this vision of evading the intake of carbohydrates. Especially when its a critical source of fuel for the brain, heart, muscles and central nervous system and lacking it can leave us with serious consequences such as muscle wasting, poor immune function and altered biochemical reactions. We just have to balance the amount of carbohydrates we ingest. It’s amazing how a carbohydrate is capable of storing energy an maintaining an organism alive in our case. 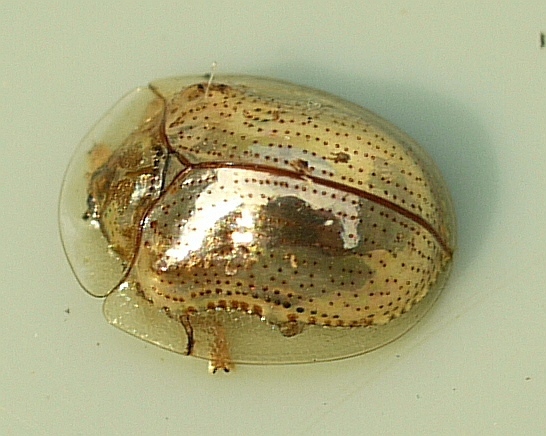 Another awesome fact is that a carbohydrate makes up the exoskeleton of an insect which was new to me. Its funny how sometimes we just want to rip them out of our diet without realizing how essential they really are to our bodies. If insects have carbohydrates in their exoskeletons, would it be possible to get nutrition from chitin? I agree. If we want to solve mayor issues that could mean human extinction in the next century, we should keep imitating nature. Carbohydrates are vital to life and are very useful for other purposes. They have amazing properties which humans have learned to used to their benefit. For example chitin, the structural polysaccharide, is used in surgical thread because it is strong, biodegradable and reduces inflammation. It’s interesting to see how the importance of macro molecules is crucial to breakthroughs as technology progresses. In this instance, scientist at IBM have managed to develop synthetic polymers, through the keen observation of natural polymers,that demonstrate characteristics such as “self healing”. Through the study of polymers of the three large biological molecules, the future in nano medicine looks bright as potential problems such as super bugs or the rejection of implanted organs can be solved at a moments notice of these polymers. Combine those synthetic polymers, with algorithms that make possible computers like Watson, handheld DNA sequencers, 3rd generation bio-printers, and graphene nanoribbons… Exciting and anxious times await us. I found interesting that monosaccharides, which are monomers that make up a carbohydrate, are substances that play an essential part in the development of life. When we consider what carbohydrates are–C, H, and O–it’s rather amazing that from such simple substances all life can be powered on this planet. I agree as without any of these substances we could not perform all the functions necessary for life. I look forward to more medical and technological advances as we keep discovering new things. As a previous comment has stated, chitin is used in surgical thread, and as we find out new information about proteins I hope we can also find new ways to take advantage of these molecules. Nothing is as efficient as the cell in terms of energy management. When we consider that there are trillions of cells inside a human, and that each one of those cells is performing many activities because of their machinery, then our achievements in technology are dwarfed. Abuse of anything is bad, and we can abuse carbohydrates, especially those we find in high fructose syrup. Natural carbohydrates we find in fruits are a good source of energy. I find curious how many people who want to loose weight shut carbohydrates of their diet by default, most of them probably don’t even know that they are essential for life. Like someone mentioned before not all carbohydrates are bad and harmful, there are other types of carbohydrates like the ones found in fruits and vegetables that our body uses as energy and if we stop consuming these then our body won’t function the way it should. Too much of anything is bad for any biological system. And with bad diets we disturb homeostasis. Too much sugar is an easy way to make something so good, glucose, into something so bad, i.e. high fructose corn syrup. People obviously don’t know the multifarious functions of carbohydrates. For example, eating carbs after a strenuous and rigorous workout is beneficial for your body’s recovery; your body needs to replenish the muscle glycogen it lost. But people don’t see it that way; most think carbs will get them fat, which is, in reality, false. Carbs ALONE won’t get people fat. People need to educate themselves about carbohydrates, and how essential they are not only for our bodies but for all of nature as well. As a matter of fact, they should educate themselves more in relation to the macromolecules that we consume and produce. The type, quality, and quantity of the carbohydrates one eats have many consequences. Some good, some not so good, and some bad. Equilibrium is key. If we disrupt the homeostasis of our bodies, by not eating properly, our cells will let us know that something is wrong. Arteriosclerosis, high blood pressure, diabetes, renal failure, etc., are but a few of the consequences of not eating properly. There are so many accounts of similarities between nature and technology. Mostly it has been after advances are made in technology that scientists realize that nature has beat them to it. Recently, scientists have been looking toward nature to make advances, such as with the newer planetary exploration vehicles now having legs to manage uneven terrain (http://www.economist.com/node/4031083). Perhaps in the future scientists can look to cellulose and/or chitin to build new structures or to starch and/or glycogen for better energy storage. It is ironic how people think that carbohydrates are not important to our body, how we think that having less of them will improve our health, when in the contrary it affects us badly. One would be surprised on how important carbohydrates are to our body, these macromolecules are essential for a healthy living, no matter if their function is structure or storage. Although low-carb diets as weight loss solutions have become increasingly popular, it is important to acknowledge that carbohydrates are essential for our nutrition and energy and also for the world that surrounds us, for example in plants, animals and fungi. Having a well-balanced diet containing carbohydrates is so important that the European Union has developed 3D printers that produce optimized food for the elderly, dominant population in the near future. This “optimized” food is made with cartridges filled up of nothing less than liquefied vegetables, meat, and carbohydrates. Carbohydrates are essential for a healthy diet, such as protein, and fats. Cutting these out from your diet in fear of weight gain is an incredibly unintelligble decision in every way. Your body needs these components for it to be able to function properly. Of course, as long as they’re balanced, to much and too little of something is bad. If you eat too many carbs and don’t burn that energy, then it will be stored in your body, thus eventually making you overweight. If you don’t eat enough carbs, then you won’t have enough energy to function and do things throughout your day. It is important to mantain a balanced diet since the body needs carbohydrates and it is one of the most important sources of energy for the body. We also need proteins and fats. This is why it is important to mantain a balanced diet so that the body can have a complete and healthy metabolism. it’s just for the first two months then you have to add more vegetables and rice in order to maintain the weight. Cellulose is the most abundant carbohydrate in the planet. Most life is made out of polymers: collagen and cellulose is what, basically, life is made out of on this planet. It’s amazing to see how such simple molecules can be the such important components for life. Carbohydrates are what gives us our energy and fuel. Apart from that they are also a form of storage in our bodies. If people were more aware of how essential carbohydrates and the other biological molecules are for life, they wouldn’t keep them out of their diets. Instead of avoiding carbohydrates people should be more inclined to have a balanced nutrition that includes all of the biological molecules in order to lead a healthy life. This link includes a list of reasons why carbohydrates are so important and why we need them in our diets. I agree. Contemporary social pressures have influenced a lot on body image. The result of this is many psychological and physiological disorders. Society as a whole pays the price of our ancient narcissism. I can surely say that carbohydrates are one of the most fundamental macromolecules not only in the function but also in the diet. The carbohydrates do provide mostly energy yet this energy can be deadly and be prone to diabetes and/or obesity if consumed in excess. Some carbohydrates are better than others. Some carbohydrates make you gain weight and that’s why people think that they are some how bad for our health, but other carbohydrates have health benefits. Carbohydrates are needed in our bodies for it to function correctly. When we discussed biochemistry, back then I was able to have a better understanding of why these molecules like carbohydrates, proteins and fats were so important. I knew that carbon is an essential element of life but I clearly understand now where are these carbohydrates found and their purposes by consuming them and I learned one of the main ways carbon enters the organism’s body. It’s amazing how these tiny carbon structures are so important for life. Polymers such as proteins and carbohydrates are the reason behind biodiversity on this planet. This is why it is so important to talk about Chemistry in any Bio course. It’s so impressive how such small molecules can be so important for our life. How your body changes them into glucose and then uses them as energy for your body function. Here’s a link that shows why carbohydrates are so important in diabetes. Carbohydrates are essential to our bodies, as they give energy and othe substances to our bodies. Monomers such as glucose give us energy. Polysaccharides such as chitin and cellulose give support to plants and invertebrates. I don’t understand diets which don’t allow carbs because the diet is preventing the person from ingesting essential substances to carry out daily activities. Carbohydrates, proteins, and lipids are all equally of importance to our bodies. Each macromolecule does a different function in our bodies to keep us alive. Carbohydrates are the ones who give us energy to work and to stay active in our daily lives. It has its disadvantages when consumed in excess amounts as any other thing. The most common source of energy in living things are carbohydrates. They are necessary organic compounds that provide energy as well as storage in many diverse way in living things. They are an essential nutrient for the replenishment of the primary source of energy, glucose. Without carbohydrates, our body would be deprived of an extremely important source of energy. Carbohydrates are a source of energy. When eaten, the body converts most carbohydrates into glucose(sugar), which is used to fuel cells such as those of the brain and muscles. Carbohydrates are one of three macronutrients (nutrients that form a large part of our diet) found in food. There are 3 different types of carbohydrates: sugar, starch, and fiber. Carbohydrates are essential in order for our bodies to function correctly. I’d kind of want to look more into how science imitates nature as demonstrated in the honeycomb like image. When some think of the future of science they think up these smooth metallic designs that are like nothing ever seen before, but so far many of the new technology takes advantage of the trial and error that countless species have underwent to gain their useful adaptations, as basis for new innovations. Everything is a remix; no single invention is totally original. In many cases what seems totally new is the result of a scientist—artist—that observed patterns in nature that no one observed before. So, even if it is ‘new’, it actually wasn’t. Nature came up with it first, possibly millions of years ago. When we began discussing polysaccharides in class, I already had the basic idea that carbohydrates were good for you and not bad. During the summer, I had researched the effects of macromolecules in our bodies and for this research I mainly used the internet. In the link provided, I learned that carbohydrates are one of the most important macronutrients that our bodies need. Carbohydrates, such as fiber, help with the cleansing of the intestines, which helps prevent colon cancer. These polysaccharides are also needed for the functionality of vital organs such as the heart, kidneys, and brain. Finally, they are the main source of energy for your body. Although carbohydrates are good for us, we must keep in mind that only natural carbohydrates are beneficial and we must keep carb intake from unhealthy sources such as high fructose corn syrup to a minimum. Biology is all about the chemistry; the interactions between highly electronegative elements (N, O) and polymerization reactions driven by Carbon’s octet rule. Carbohydrates are sugars, starches, and fiber found in foods. They are essentially derived from plants, meaning that they are synthesized by photosynthesis and are primarily stored in the seeds, roots, stems, leaves and fruits. Their importance is for the purpose of reserved energy and structural components. It is said that at least 55% of the daily calorie intake should come from carbohydrates. Us humans don’t appreciate or understand the importance of these macromolecules and what would happen without them. Not being able to inherit or process carbohydrates means that we wouldn’t be able to have enough energy to function. In the link provided it shows a brief summary of the importance of carbohydrates and what we should know about them. As we discussed in class, macromolecules are formed from various functional groups and are essential for life. In order for molecules to form, we need polymerization to create polymers from monomers. Monomers can be all kinds of shapes and sizes, of the first example seen; its shape is like a beehive. This comparison is made because bees practically make their own food just like we make the polymers needed to make sugars. Those sugars are the fuel of our body, just like honey is for bees. But just like polysaccharides are used for fuel, they are used for energy storage too. The example given is potatoes. Why? Because potatoes contain starch, which contain glucose itself, the one responsible for the making of sugars in our bodies. We also have glycogen, a giant polysaccharide, with the same purpose of storage. Meanwhile, cellulose is a polysaccharide responsible for structure. It is used mainly for building and holding plants, therefore making their cell wall. As we can see, all polysaccharides and macromolecules have a purpose in life. Some are for energy storage, others are for fuel, and others for structure. They all have their importance in life, either for humans, animals, or plants. They can help make proteins, sugars, or they can help by protecting the organism and its cells. Making everything vital for our survival and the survival of life itself. Eventually technology may use this molecules to make new types of medicine and help thrive new discoveries in science.